ANORAK will soon bring you the Magazine Dead Pool – which magazines will die next. 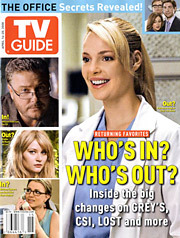 As the ailing media industry takes more hits, the magazine TV Guide has been sold for $1 to the private equity fund OpenGate Capital. The buyer also agreed to assume the unprofitable magazine’s liabilities. The magazine’s cover price, by comparison, is $2.99. TV Guide has 3 million subscribers. They could have got a TV Guide for free online. Shhh!